‘Twas the night before Fiesta and all through Linn Park…not a creature was stirring…well, THAT’S not exactly true! 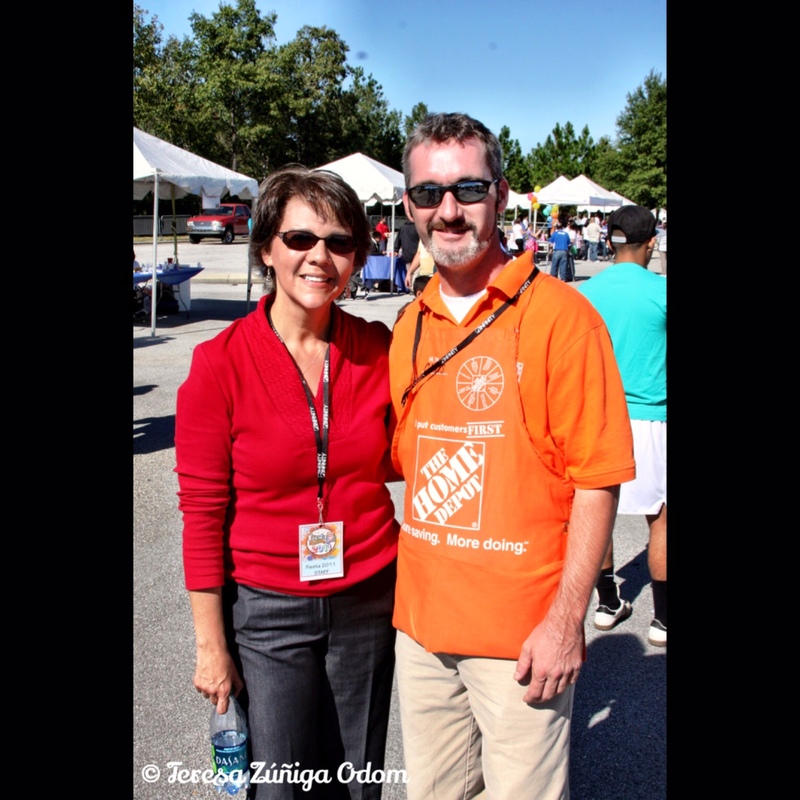 Fiesta’s event planner extraordinaire, Denise Koch of Denise Koch Events, was there working with the tent company, and others to get the park ready for Fiesta 2014 tomorrow! Remember, Fiesta takes place tomorrow – Saturday, September 27th, from noon to 8 p.m. in Linn Park…admission is $8 at the gate and children 12 and under attend for free! Here are a few photos of the event prep and also Fiesta’s morning on Fox 6 News with Jeh Jeh Pruitt to promote the event. It’s always fun to find a Coca-Cola Truckback with the Fiesta poster every year! 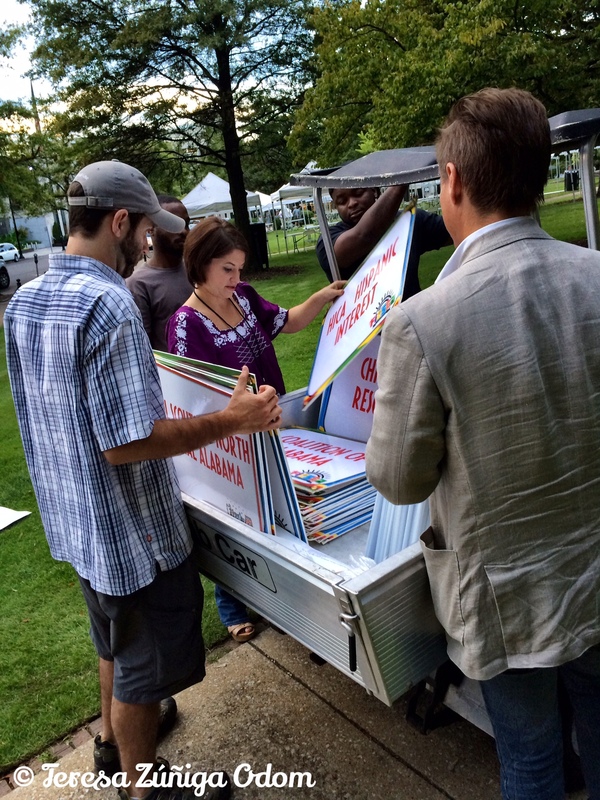 Our event planner, Denise Koch, works on getting the signage up in Linn Park. The McDonald’s Fiesta Tour arrives at the park! This exhibit is so incredible – can’t wait to see it again! 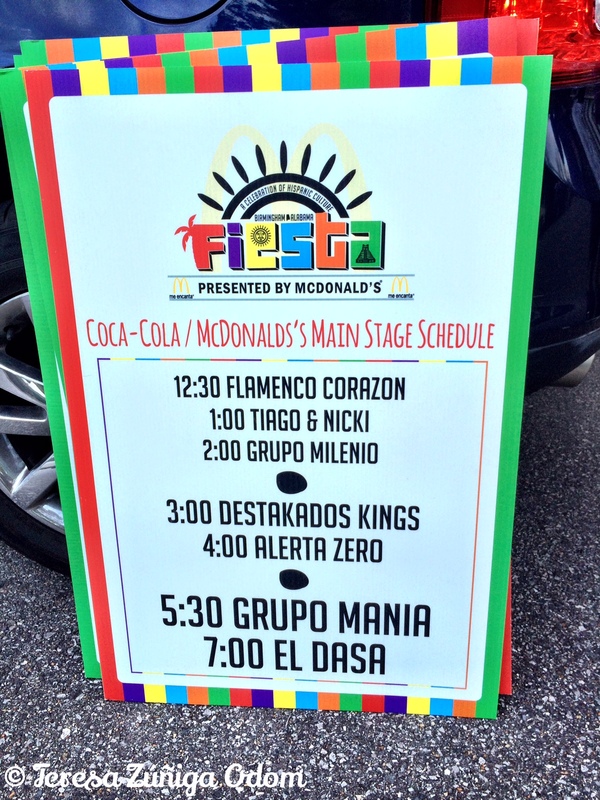 Main stage schedule of acts for Fiesta 2014. 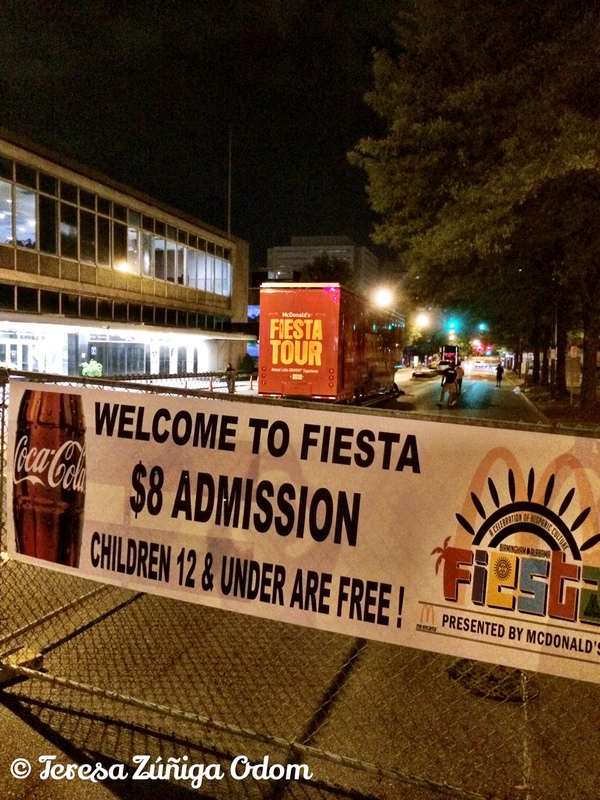 A look at some of the Fiesta signage and the FiestaTour in the background in front of Boutwell Auditorium. 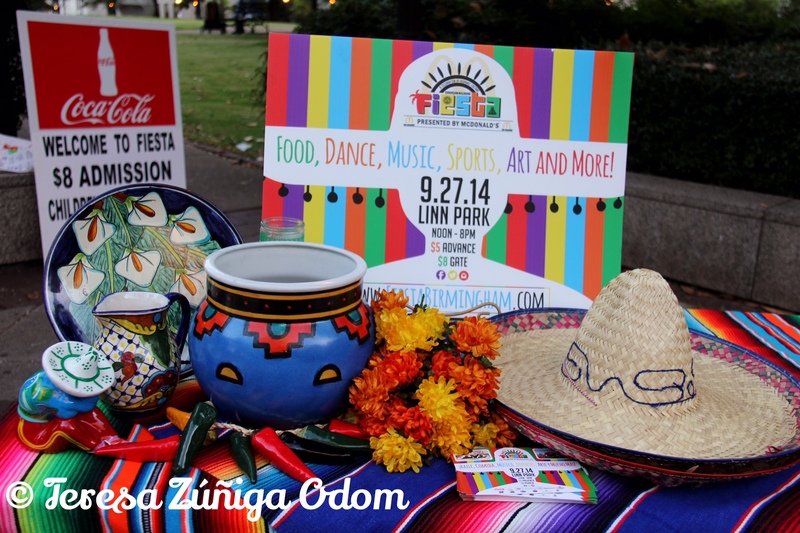 Linn Parks presents…Fiesta 2014! Nice place for our sign! 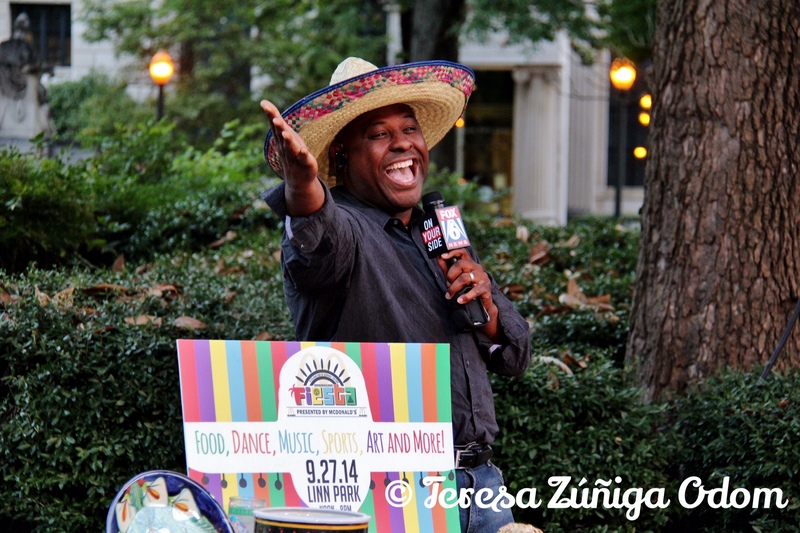 Jeh Jeh Pruitt gets into the first Fiesta segment on Fox 6 News! He really liked that sombrero! Ronald has fun with Nicky and Vincent Koch in between Fox 6 News segments. 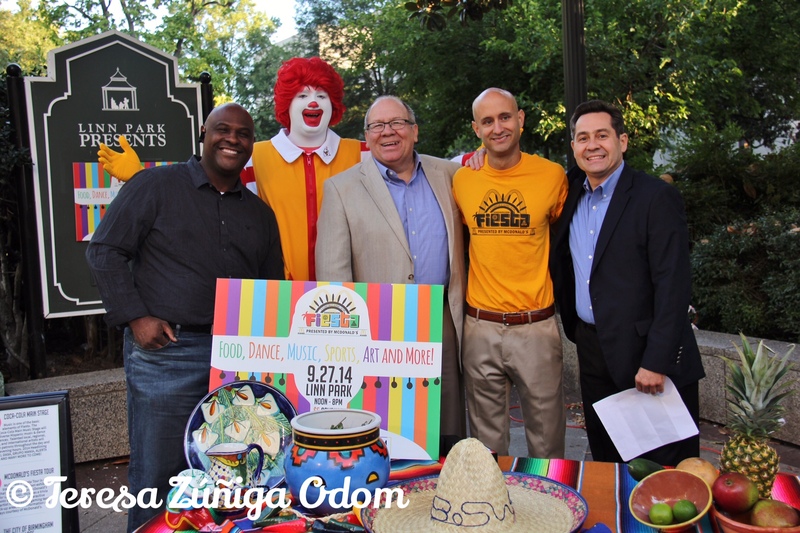 Fox 6 news coverage of Fiesta with Jeh Jeh Pruitt, Matt Ennis (Fiesta Board President), and Birmingham McDonald’s owners, Santiago and Russell Negre…and of course, Ronald McDonald! 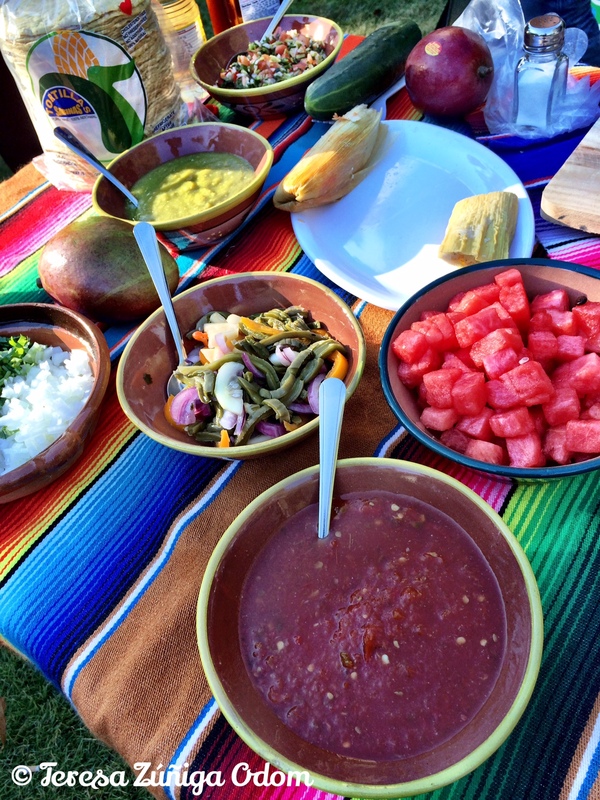 Cooking segment featuring Mi Pueblo on Fox 6 News – the food at Fiesta is always the best! Table set up for the Fox 6 News Segment. 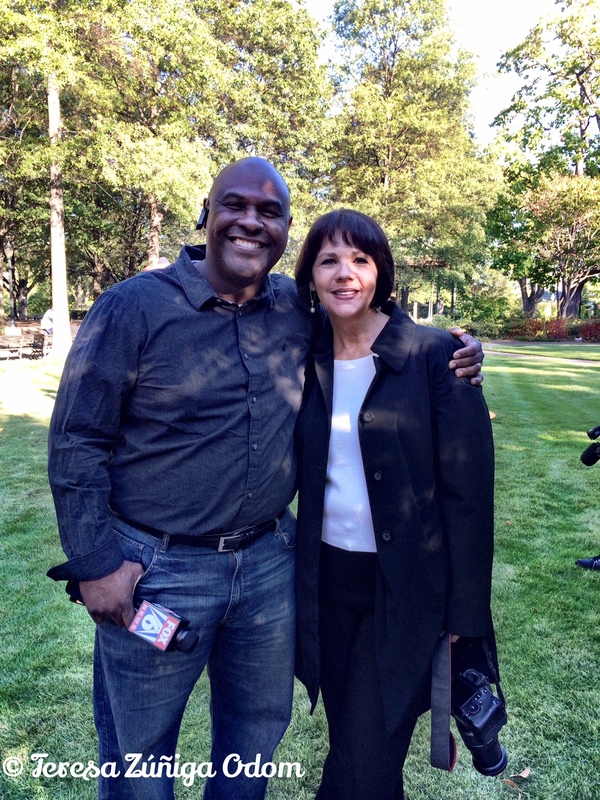 Photo opp with Jeh Jeh Pruitt in between Fiesta segments. He’s such a fun guy! 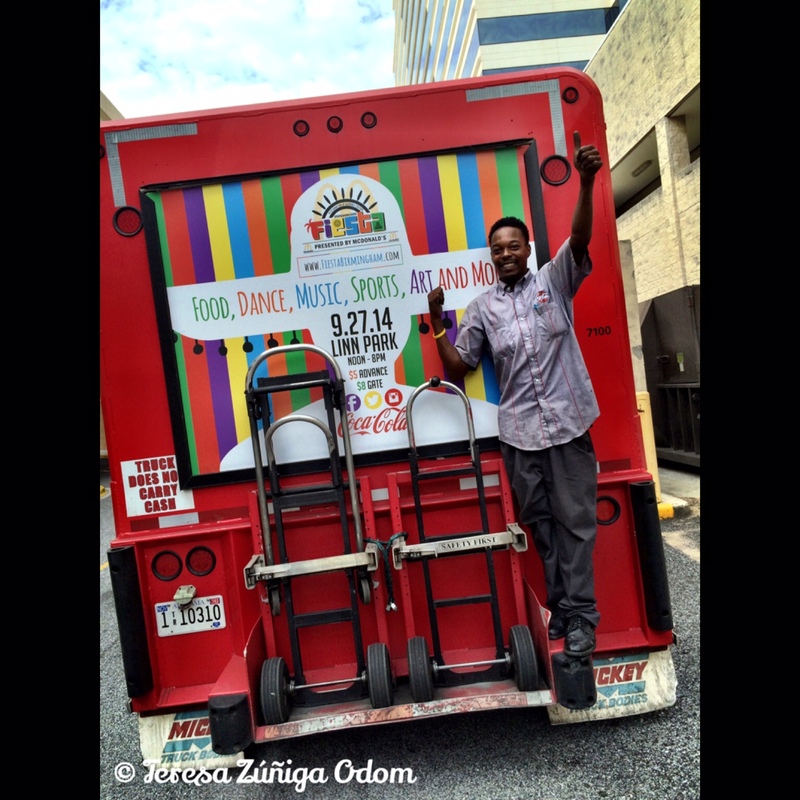 This entry was posted in Fiesta, Hispanic Heritage Month, Hispanic Resources and tagged Birmingham, Coca-Cola, Culture, Dance, Festival, Fiesta Tour, Food, Fox 6 News, Hispanic, Jeh Jeh Pruitt, Linn Park, McDonalds, Music, Truckback on September 26, 2014 by Southern Señora. 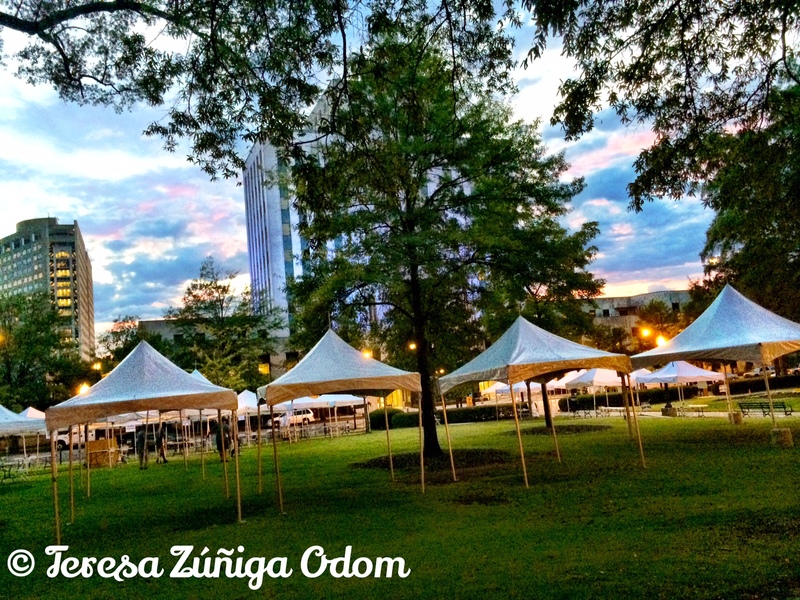 The 12th annual Fiesta – Alabama’s largest celebration of Hispanic culture and heritage, will take place this Saturday, September 27th in Birmingham’s Linn Park! What a journey this has been! I was a founding board member of this event 13 years ago as a member of the Birmingham Regional Chamber of Commerce’s Hispanic Business Council (HBC). The event was created as a way to award scholarships to Hispanic students in the state. To date we’ve awarded over $50,000 in scholarships and hope that amount will continue to grow as we grow the event. Fiesta was also created to showcase the best of Hispanic culture and to show that not everyone who speaks Spanish is Mexican. Back when the event was started, that was quite the issue. But another founding board member, Mike Suco, said it best…he said, “I’m Cuban, but it doesn’t mean I eat salsa!” That quote has stuck with me all these years. There are so many stereotypes surrounding the Hispanic community in the Birmingham region. Fiesta exists to help dispel many of those by bringing the Birmingham Latino community together to showcase the best of what each country offers. 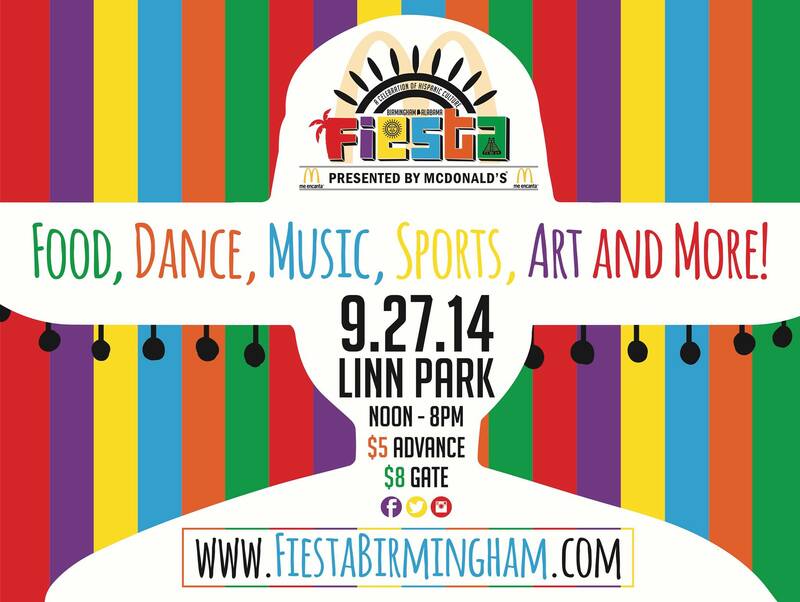 To me, it’s the heart of what Fiesta offers to Birmingham and the state. I remember the first Fiesta in 2003 like it were yesterday…we were so excited about the event but thought we would only have an attendance record of about 2,000 people max. Imagine our surprise when we had about almost 7K people come through! 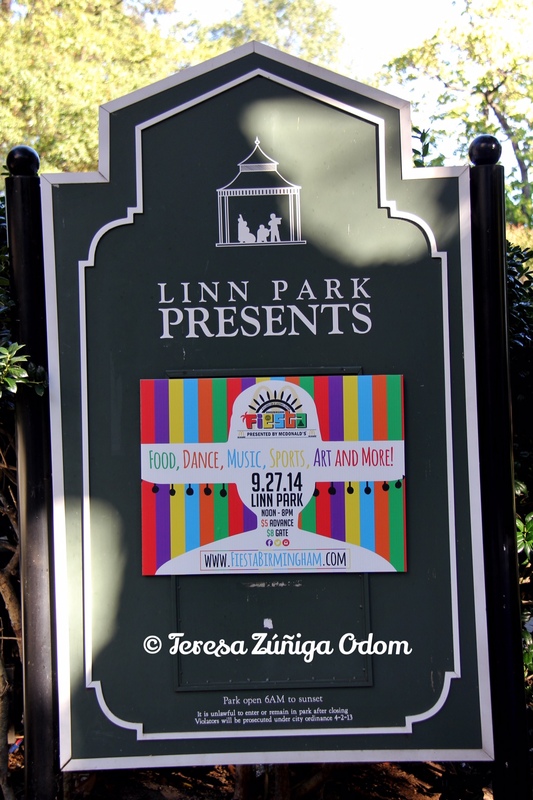 I remember walking through Linn Park that day, snapping pictures (as the “official” Fiesta photographer), and being absolutely giddy – along with the other board members – about the number of people we were seeing come through! It was clear to us then that this event was not only something that the community needed, it was something the community was embracing as well! One of my favorite aspects of Fiesta each year is taking photographs. I get to see and photograph people reconnecting, sharing stories and making new connections. I remember the first year taking pictures with film! I think I took about 15 rolls of pictures that year. Now, with digital photography and all its capabilities, I average about 1,000 pictures each year! And while I love going through my photos at the end of the day…I LOVE seeing what other photographers capture at Fiesta these days. It’s great to flip through Facebook and see Fiesta photos each year. More proof that Fiesta is an event NOT to miss! Hope you will come out this year – our 12th year – and experience what Fiesta has to offer. One special note – McDonalds is our Title Sponsor this year! And they are bringing their Fiesta Tour to Linn Park. Such a treat and something you won’t want to miss – I saw the tour at the National Council of La Raza (NCLR) in Chicago a few years ago and was so impressed! The Fiesta Tour showcases Latin artists such as Gloria Estefan, Selena and Celia Cruz. You really need to see this! 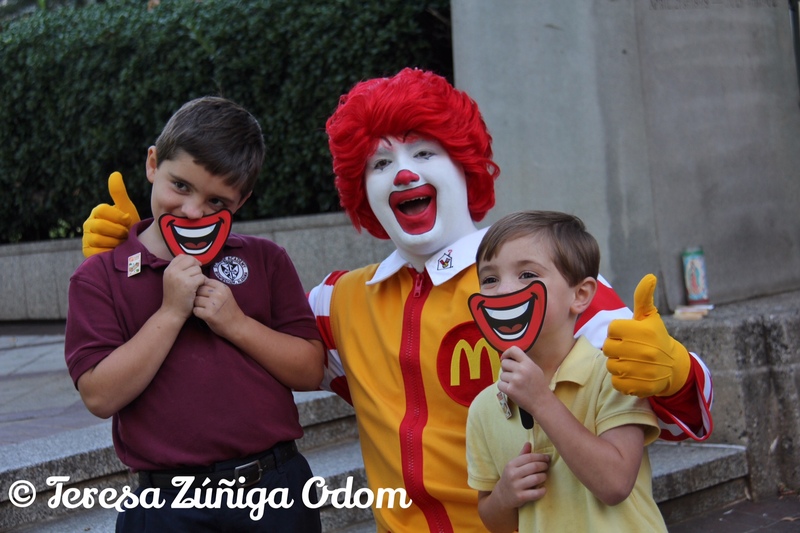 We are forever grateful to Birmingham McDonald’s owner Santiago Negre, for making this possible! Tickets are $5 in advance and $8 at the gate. Fiesta starts at noon and runs through 8 p.m. See you there! 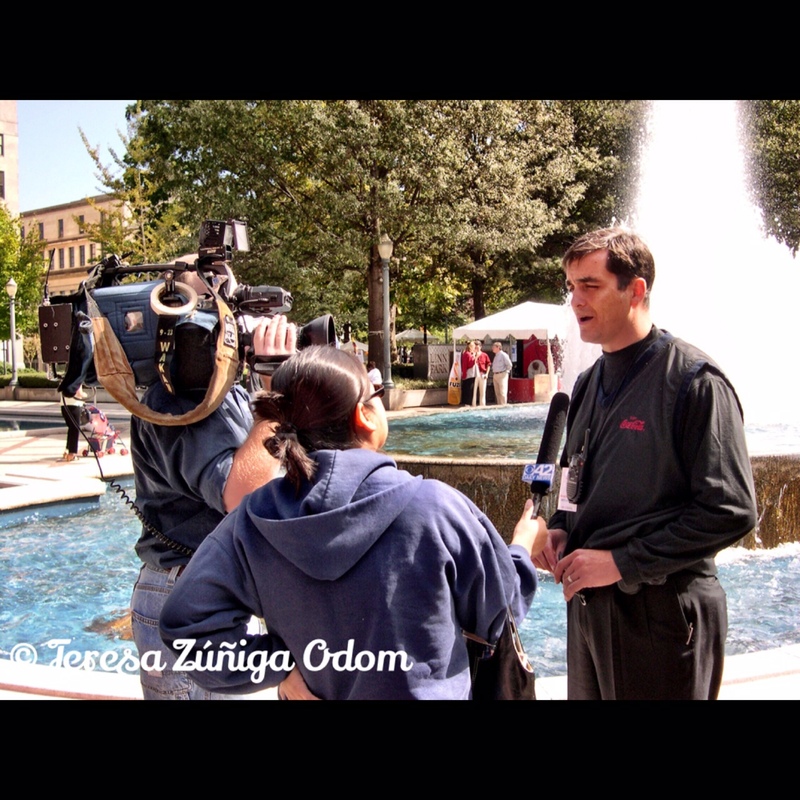 Fiesta 2004 – then President Mike Suco speaks to the media during Fiesta’s 2nd year. 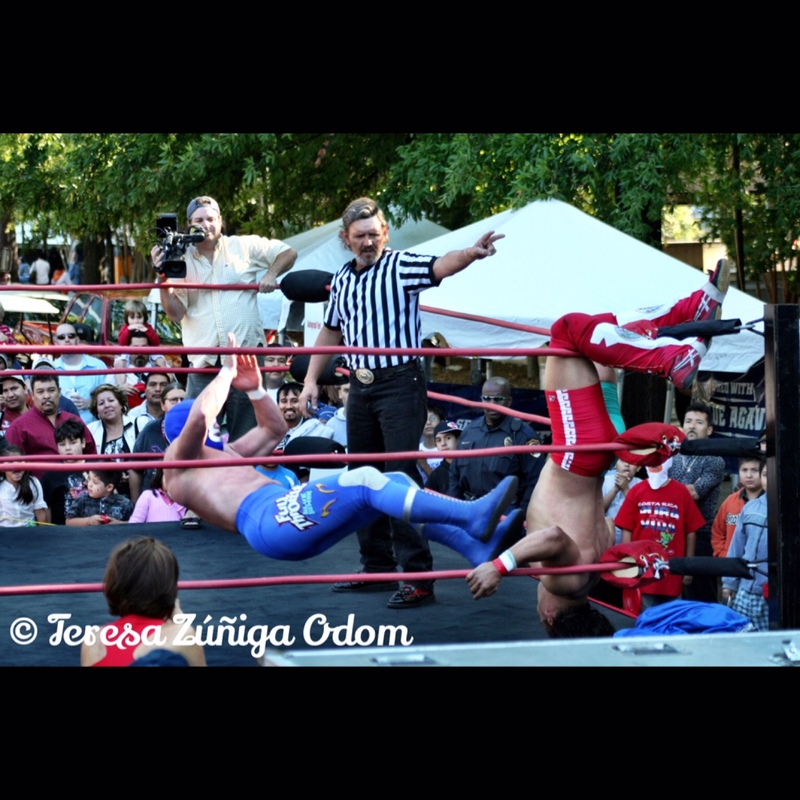 Fiesta 2008 – Wrestling makes an appearance at Fiesta with the Blue Demon! 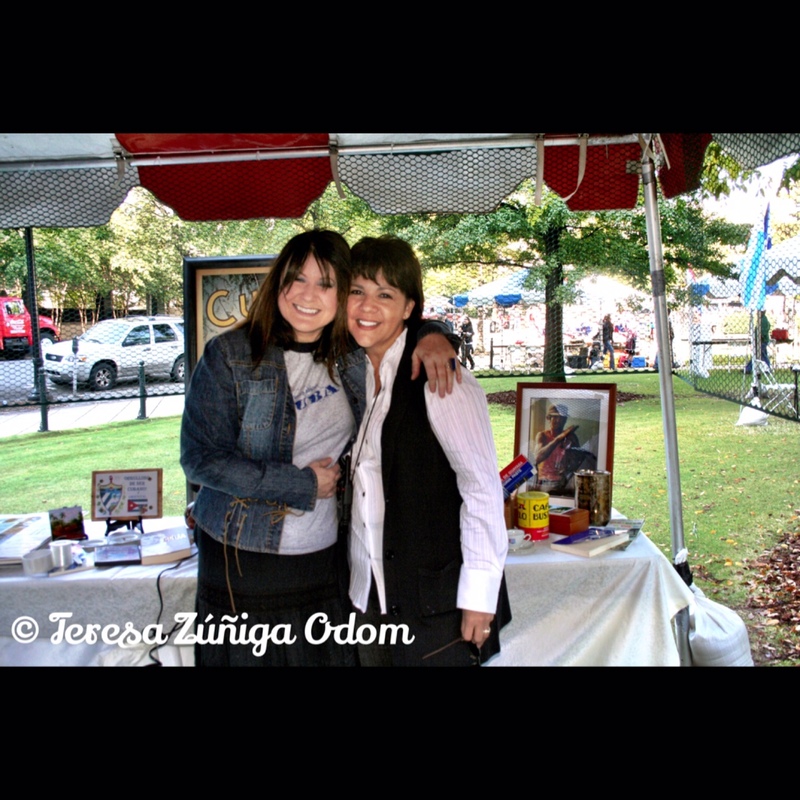 Fiesta 2008 – getting a hug from my Cuban friend Lizette at the Cuban booth in the Cultural Village. Fiesta 2008 – one of my most favorite photos from Fiesta and most often used in Fiesta advertising. The colors are incredible! 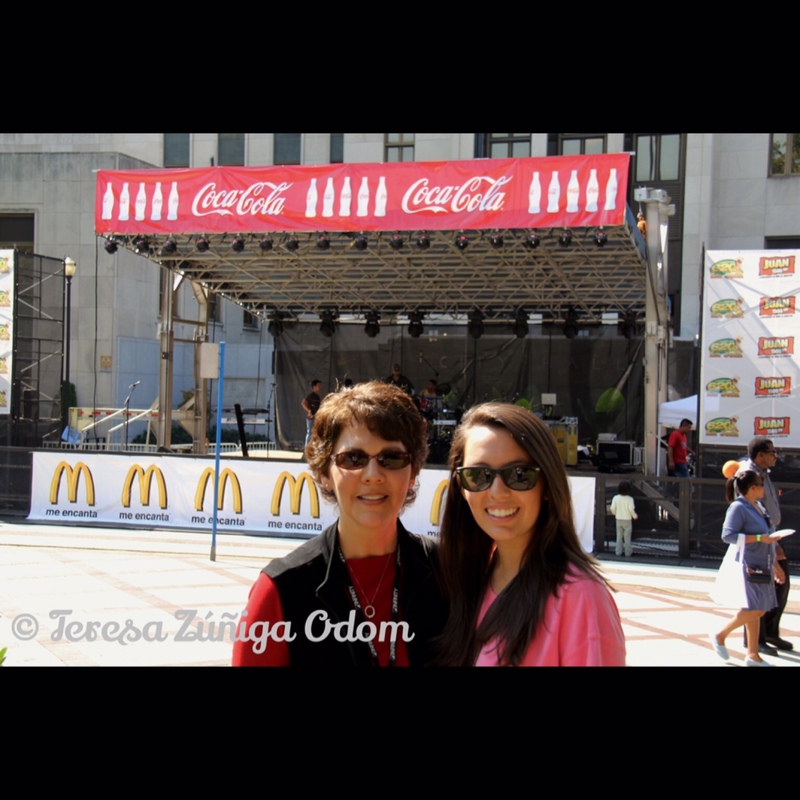 Fiesta 2011 – in front of the Coca-Cola/McDonalds Main Stage with my daughter, Anna Marie. 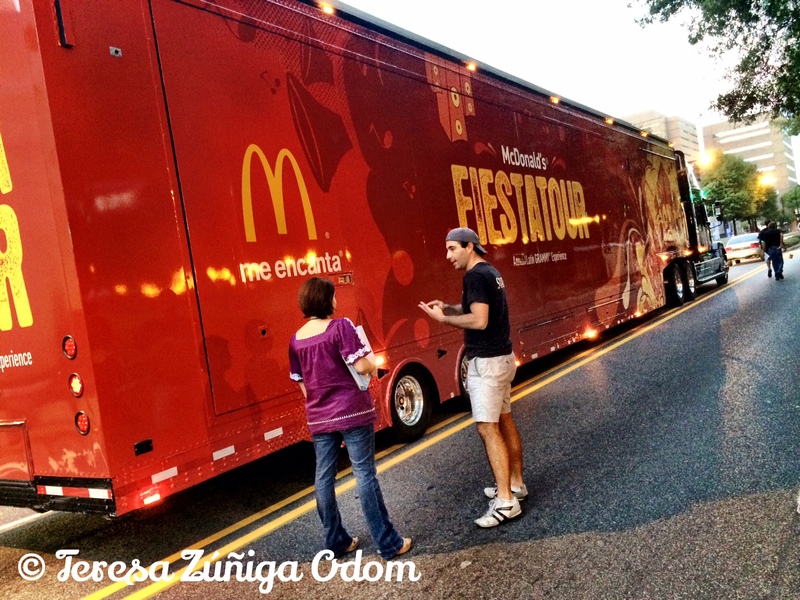 This entry was posted in Fiesta, Hispanic Heritage Month, Hispanic Resources and tagged Coca-Cola, Culture, Festival, Fiesta, Fiesta Tour, Linn Park, McDonalds, NCLR, Photography, Scholarship on September 21, 2014 by Southern Señora. 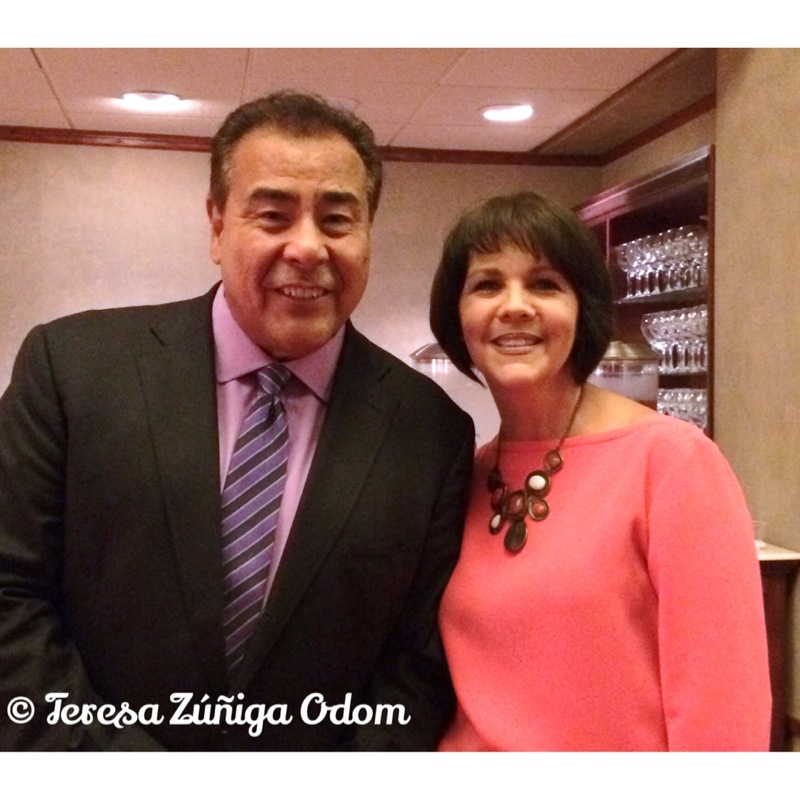 What Would YOU Do?…if you met John Quiñones? Well, first things first…you take a picture with him! Then you listen to his amazing story! It’s Hispanic Heritage Month and my alma mater, the University of Alabama at Birmingham (UAB), does things BIG where recognition and celebration are concerned. Each year they bring top Latino powerhouse speaker to students and the community at large. 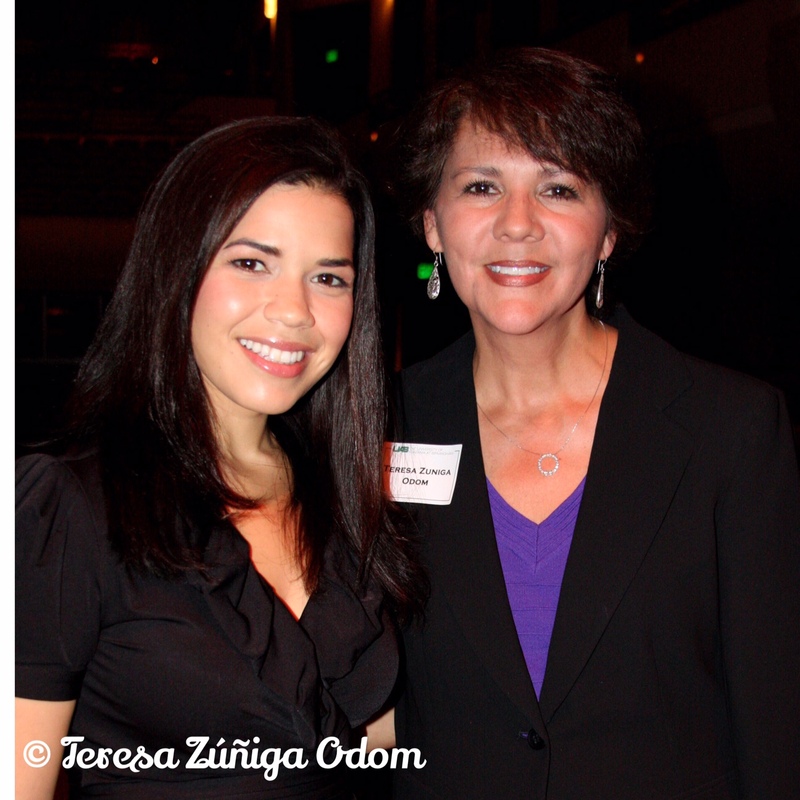 I’ve had the privilege of hearing and meeting Actress-America Ferrera (2011) and Actress/Activist-Rosario Dawson (2012). 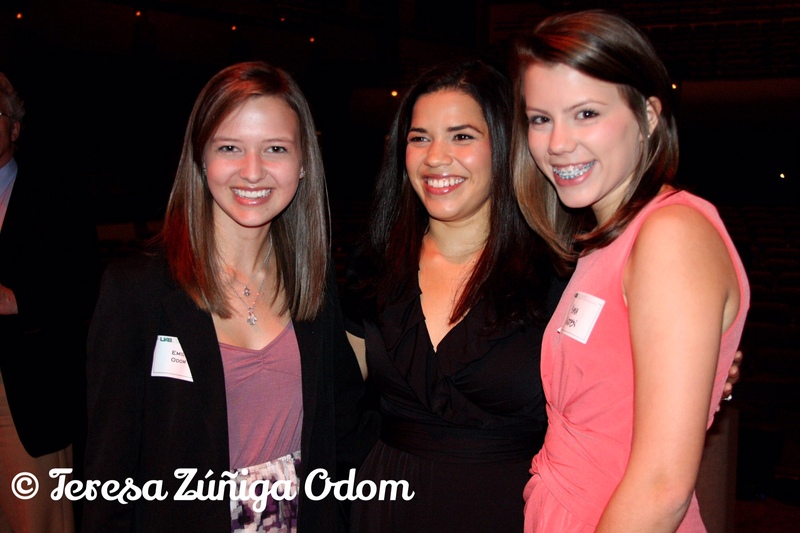 Last year Soledad O’Brien, Broadcast Journalist spoke about her CNN series Latino in America. All have brought great and inspiring messages to the students. I love hearing the Q&A portion of the evening and the poignant and heartfelt questions the students ask of the speakers. 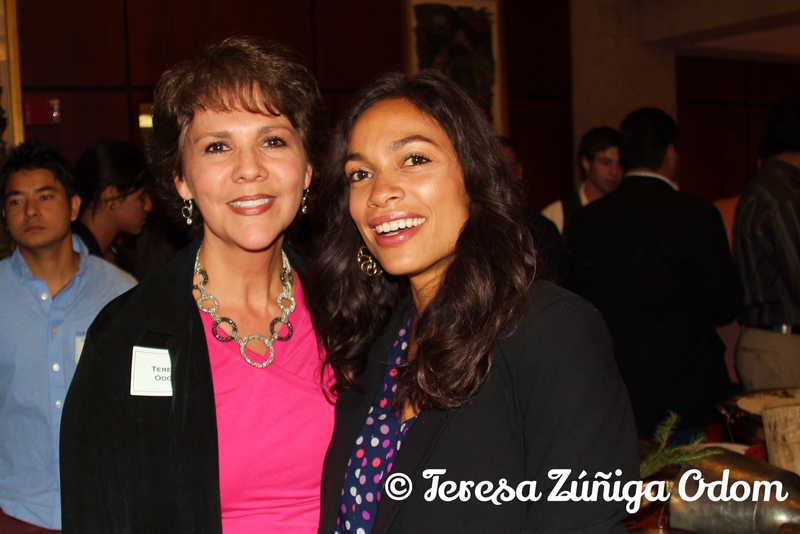 With Actress Rosario Dawson at UAB in 2012 for the UAB Lecture Series. He spoke of his great fortune in joining Upward Bound, a program out of St. Mary’s University, a federal TRIO program that helped prepare him for college. Ultimately, John earned a master’s degree from Colombia University’s School of Journalism. Soon he was working in Chicago at the local CBS affiliate and posing undercover as a migrant worker to cover a story he suggested to his bosses about why Mexicans cross the border illegally for a better life in the UA. He won his first Emmy for this story. The irony in all this? The kid who was punished for speaking Spanish as a 6-year-old ended up getting an anchor job because he spoke Spanish! He covered Latin American news for a number of years, in fact, he has covered stories all over the world. And of course, there was much discussion about his award-winning TV show “What Would You Do?” Several clips from the show were shown and discussion followed. It’s such a study in human behavior and our own biases. The students had a lot to say about that! 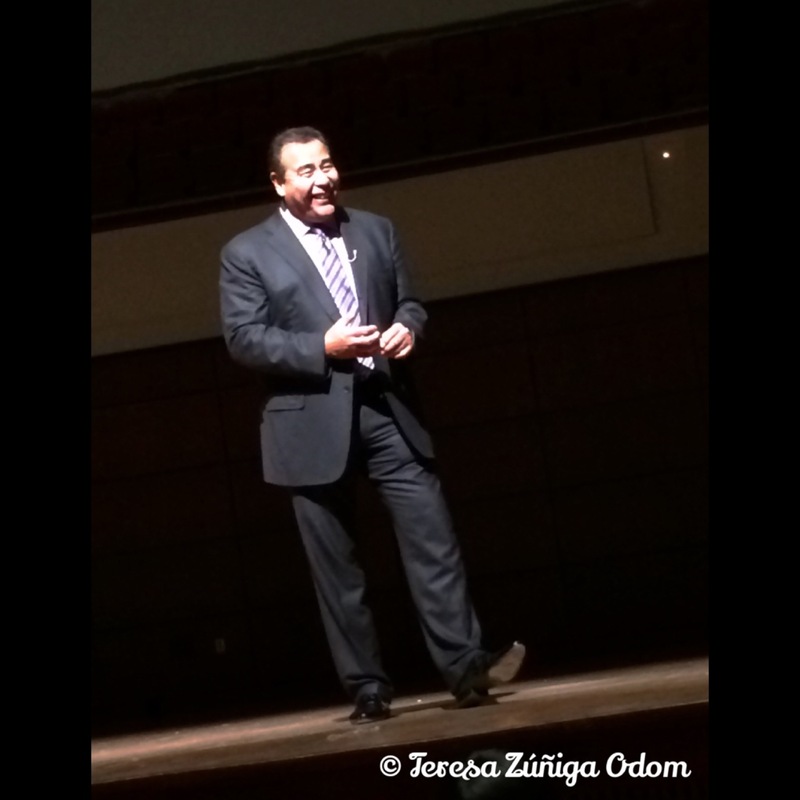 Having John Quiñones in Birmingham, Alabama during Hispanic Heritage Month was the best way to kick off the festivities for me. Oh…and this wasn’t the first time I had the great fortune of meeting him. 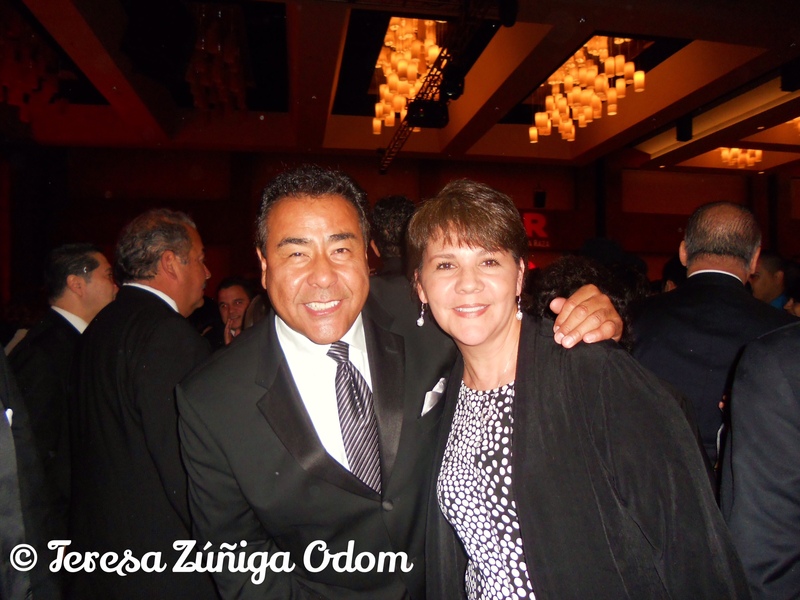 I had a photo opp with John in San Antonio – his home town – in 2010 at the NCLR (National Council of La Raza) conference. In the flurry of the NCLR Gala Event, he was very gracious and posed for a picture with me. So proud of my Alma Mater UAB, for providing such excellent speakers for their students and community. Shout out to the Student Multicultural & Diversity Programs, UAB Lecture Series, and the Office of the Provost for Student & Faculty Success for a great event. Can’t wait to see what next year will bring! This entry was posted in Hispanic Heritage Month and tagged America Ferrera, Hispanic Heritage Month, John Quiñones, Mexican-American, Rosario Dawson, UAB Lecture Series, What Would You Do on September 18, 2014 by Southern Señora. Southern Fried Mexican-Am​erican by way of Southeast Asia! I am launching my blog – Southern Señora! Latinos have been in the south for a long time – personally, I’ve been in Alabama since 1981, and I’ve seen the landscape change pretty dramatically in that time. There was a time when I could chit-chat in Spanish with my youngest sister at the local mall and no one would understand what we were saying. That’s definitely not the case anymore! As the Hispanic community began expanding in the Birmingham region in the late 1990s, it wasn’t uncommon to hear Spanish being spoken more and more. And Latinos began exploring small business ownership and other entrepreneurial ventures. Translation businesses, Hispanic marketing firms, and Spanish-language newspapers and radio stations began popping up, just to name a few. More Mexican restaurants sprouted too and some restaurants had one standard menu for the general public, but would post a more traditional menu on the door for their Mexican clientele. I remember how excited my dad was about seeing “menudo” – a spicy traditional Mexican soup made from tripe – posted on the door of our favorite local restaurant bringing back memories of when grew up in Carlsbad, New Mexico. Latinos are making tremendous contributions in Alabama, be it through business, art, culture, or non-profit work. Sharing their great work and stories is part of what I want this blog to be about. I’ve made some great friends over the past 15 years as a Hispanic community volunteer. I love being able to connect people and then watch what happens next! 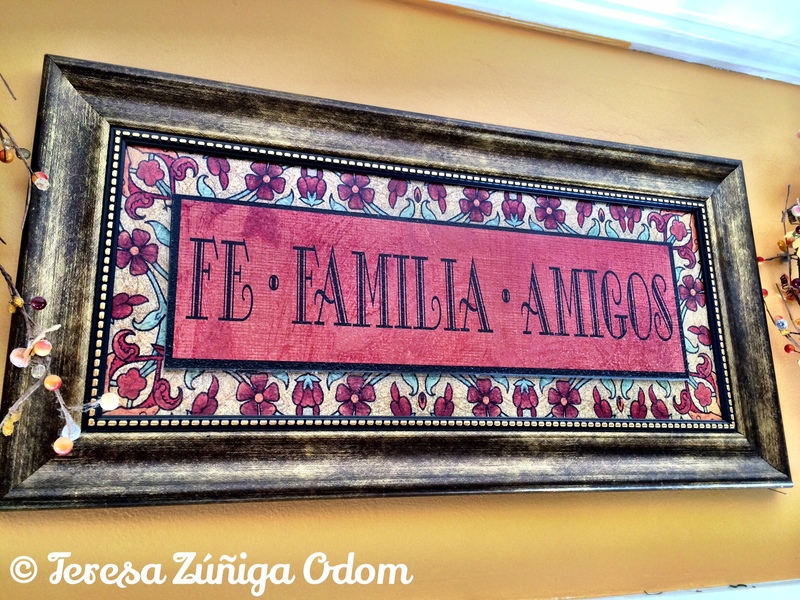 I will also be sharing stories about my Mexican-American family – hence the title of this post! More details on this later but just to tease a little – my dad was born in Carlsbad, New Mexico of Mexican-American parents – my blonde-haired-green-eyed mom was born in Oneonta, Alabama – they met and married in Cambodia, and I was born in Bangkok, Thailand. Whew!!! See what I mean? As other Hispanic or Multicultural related subjects and “odds and ends” pop up, I’ll share those too. And finally, I’ll be sharing a LOT of photographs! It’s been a hobby of mine for many years and I like to think I’ve been influenced by my father’s amateur photography. He was such a perfectionist and had quite an eye for composing a photograph. You’ll see some of his photos here too. So let’s get this blog started…VAMONOS! 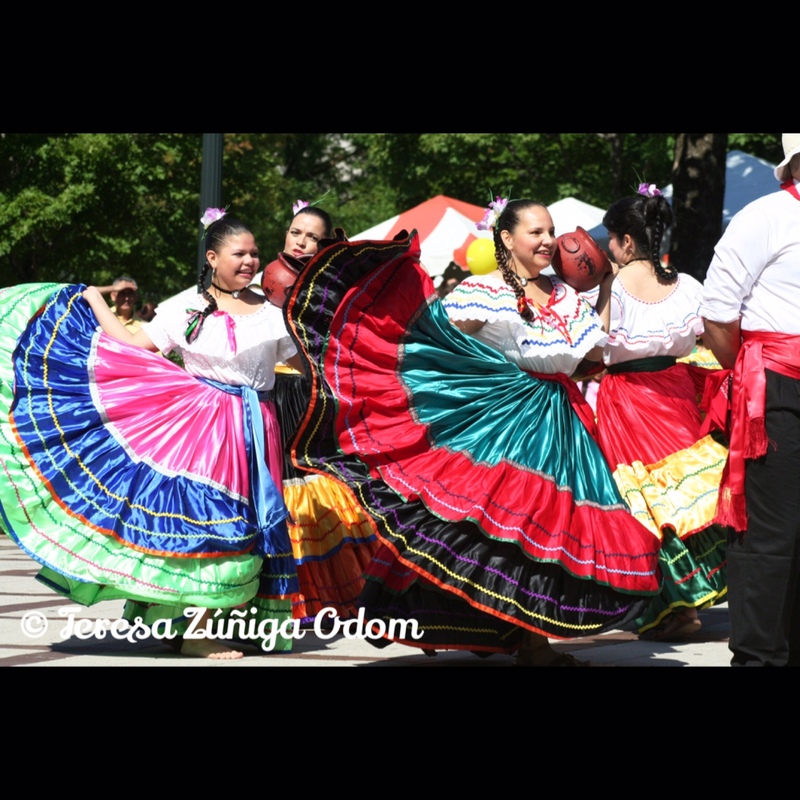 This entry was posted in Familia, Hispanic Heritage Month, Photo Vault and tagged Alabama, Birmingham, Hispanic Heritage Month, Latina on September 14, 2014 by Southern Señora.